The investors who swooped in after financial troubles made one prime Pike/Pine development opportunity available earlier this year have decided to double down in the neighborhood. The Arizona-based Wolff Co. announced Wednesday that it has purchased the Sunset Electric building at 11th and Pine for $6.7 million. The developers plan to continue the approved mixed-use project started by seller Pryde Johnson which faced foreclosure on the property. “We believe very strongly in the quality of the Capitol Hill neighborhood and are excited to be a part of the effort to bring some of its more historic buildings back into service for the benefit of the entire community,” Tim Wolff said in a statement on the purchase. The ambitious project will incorporate a facade of the old Sunset Electric factory where the 11th and Pine poster wall stands today. The Sunset Electric project will include 89 residential units above the restored auto row building with two-floor tall commercial spaces at ground level and underground parking for 33 vehicles. The building is currently *partly* empty and boarded but a cultural center in the area thanks to its wild and wide array of posters, street art and random things that get stuck to its old, masonry walls. UPDATE: Thanks to Lola for the question in comments. We’re checking whether the structure housing The Crypt and Purr is, indeed, part of the development parcel. We’ll follow up with Wolff to ask them about plans to work with any existing tenants. UPDATE: According to county parcel records, Purr and the Crypt are part of the adjacent building not the parcel slated for redevelopment. Pryde Johnson purchased the building for $2.9 million in 2006. Its development project began the public design review process way back in summer of 2009. With the six-story project’s land use permit approved and valid through March 2014, Wolff can pick up where Pryde Johnson left off and carry the Weber Thompson design forward. 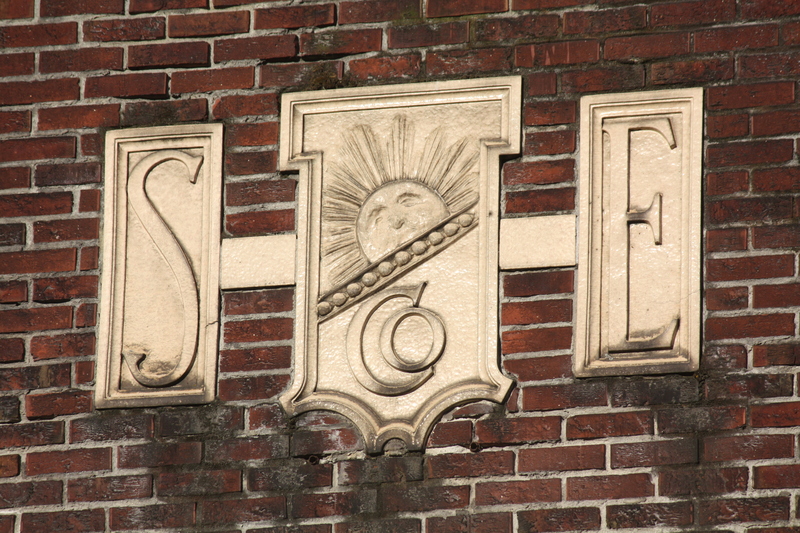 The Sunset name refers to a manufacturing company that called the 1916 building home for a time. It is also known as the Spray King building and was once home to Winton Motor Co., according to neighborhood activist Dennis Saxman. The project was planned to be part of the city’s Priority Green Pilot Program. We published this series of artist renderings of the project here. Wolff now has two major investments at play within blocks of each other in Pike/Pine. 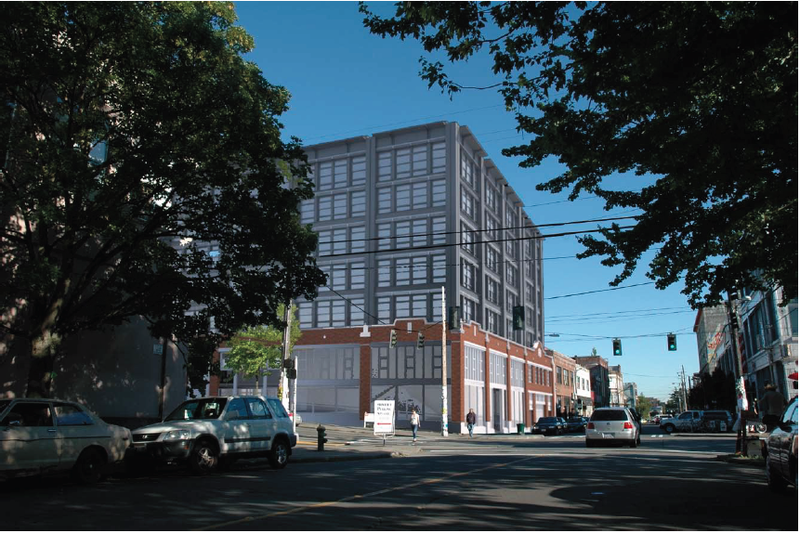 Last month, CHS reported on the $14.9 million purchase of the old BMW facility between Pike and Pine where the developers are planning a mixed-use apartment building that will incorporate the old facility’s brick facade. 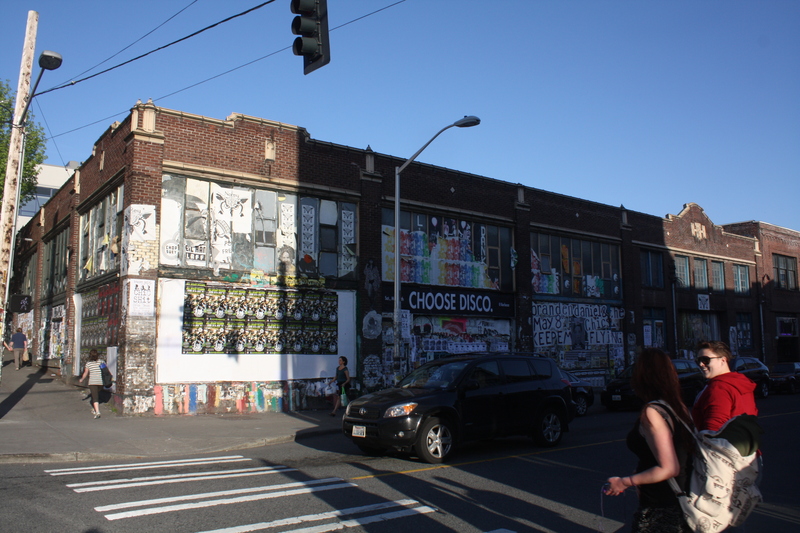 Both projects are now part of what is being called an “unprecedented wave” of development in the Pike/Pine neighborhood that is putting zoning and preservation laws to the test. 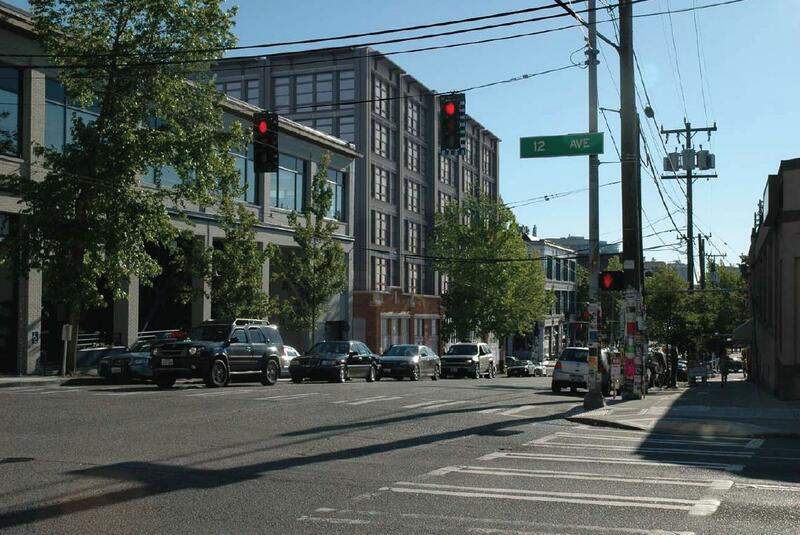 As with the 714 E Pike project, the developers have again created a site intended to provide information on the 11 and Pine development and collect feedback. You can find it at 11andpine.com. The new structure sticking out of the old brick facade looks rather boring. But it does have a bit of an industrial look to it, with windows not typical of the average new condo building. And of course bonus points for keeping original brick facade. I don’t mind boring as long as they’re keeping the original brick facade and the new development blends in. I must admit that I will sort of miss the poster walls. They raised ugly, grafitti covered fire traps to a level approaching beauty. blends in as in boring…. Maybe beautiful to Helen Keller or Stevie Wonder. PLEASE, put some decks on these things. Give it something to stand out and make it pop. Why you would build a new set of condos w/o decks is beyond me. It’s what everyone wants in the city. I guess that this will follow the trend of bricks on the bottom, giant shipping container with windows on top. The fact they’re keeping the historic elements and 2-story ground space is a step in the right direction in my book. Reminds me of how they did the Packard Building one block up Pine. May not be the most striking of buildings, but I vastly prefer that approach to the bulldoze-and-replace-with-schlock trend that’s happening in lower Pine. I can see the beauty in those walls too. Truly….there should be some requirement that, if you’re going to keep the original facade, the rest of the building must work WITH the existing design, not against it (as is the case here). Why bother otherwise? Isn’t that 11th and Pine? Yes. Fixed and but apparently re-introduced. Thanks for the note. Fixed again. What about current residents in south end of building? Purr and the studios above it? Good issue. I took a look at the parcel and we’re checking into it. I’ve updated the post above and will follow-up. where am I supposed to put up posters now?? What about that awesome mural/painting of John T Williams? 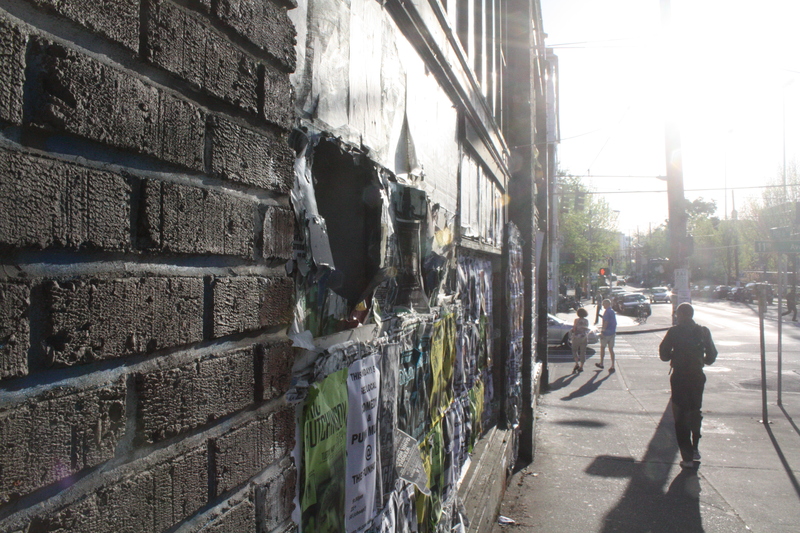 I sure won’t miss this ugly, trashed “poster wall,” ….this kind of vandalism is, in case anyone has forgotten, illegal according to the City’s postering regulations….and it’s irrelevant whether the building is occupied or not. To call this a “cultural center” is absurd, and made me laugh out loud. Oh, yeah, the decks are so wonderful….ha! Most of them are about 2’x4′, totally un-useable, and added to the new buildings for the sole purpose of meeting the “open space” code requirement. They are tacky and interfere with the overall design of a building. 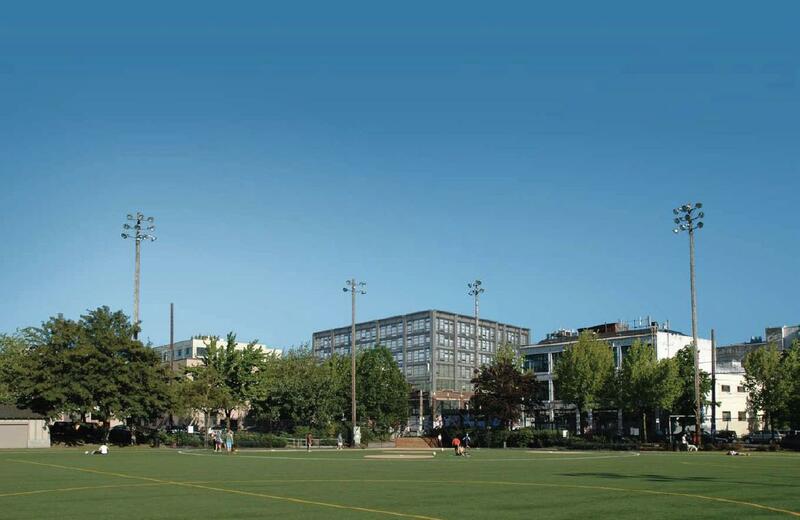 Tenants should be prepared for the incredible extra light they will have from the sports lighting at the park. I lived a few blocks east on 13th and Denny and could read in my living room using only the park’s lighting. A deck in the city is only useful for smoking, and even then it’s not very functional. Decks are pointless. In 100 years that will be what the citizen of Capitol Hill will be fighting to save. The level of banality of this and other similar multi family structures in the area is staggering. What is so unique about the brick facade that is should be retained? Why is the structure which it surrounds so out of keeping with the brick? Why is it that all we get is a box with no relief? Why is 100% of the lot covered by building with no off-street open space? Why does the facade have no visual interest and no interesting characteristics? Why? Why? Why? Well I guess I know why. Because it is cheap and all about the money.